"Making sense is overrated... It's just confirming what people already think. Making new sense is more important." Making eloquent new sense is Rob Davis' forte; making a nuisance is Vera Pike's. "Mum wouldn't tell me what was going on. She wouldn't speak to me at all. I tried asking Dad, but she confiscated him and locked him in a kitchen draw." We first met Vera in THE MOTHERLESS OVEN, my favourite book of that year, wherein we learned that although it is commonly acknowledged that children are the products of their parents - both by nature and nurture - in The Bear Park the parents are very much the product of their children. They are fashioned by their children before they are five in the Motherless Oven itself. They can be quite complex and caring. Certainly they are sentient. Scarper Lee's Mum was a barber-shop hairdryer and ever so maternal. 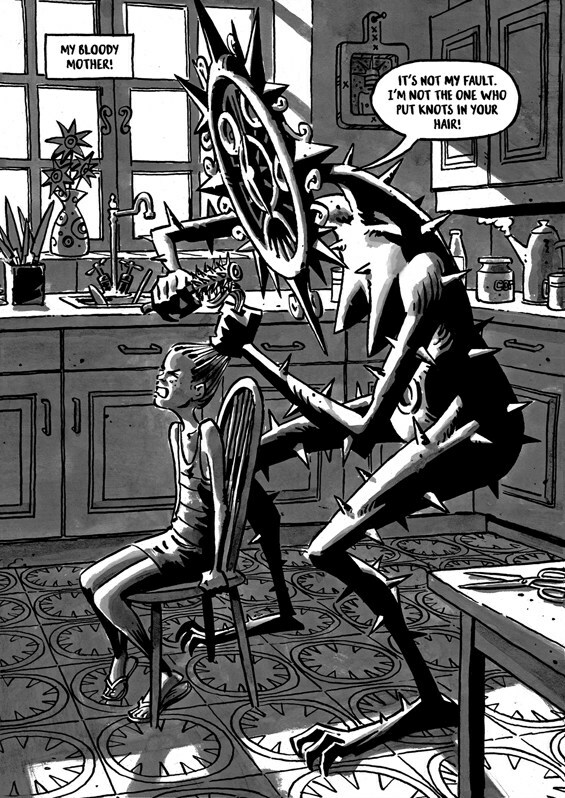 Vera Pike's Mum is the Weather Clock, Grave Acre's bipedal, fully mobile, ruthless, dictatorial Prime Minister. She doesn't do maternal. Her Dad is a can opener. The sort with a bayonet blade you have to thrust in to puncture whatever it is you want opening, then wrangle the lid off by force. He doesn't have a leg to stand on. You will find everything here so very familiar, yet looked at anew, askew or turned on its head. Words may have multiple meanings depending on intonation or a minor adjustment. 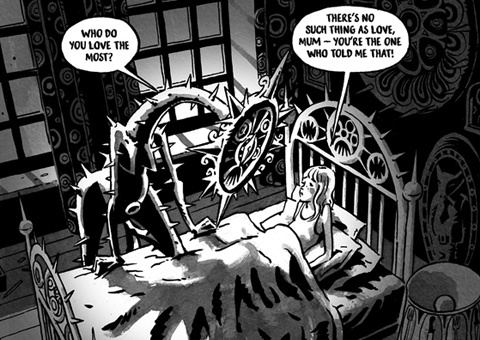 Almost every panel demands a quotation, so dense is the wit on display. Perspectives are important, the fresher the better, so here is the second in Rob Davis' trilogy, dovetailing precisely into the first to illuminate elements of what went before and leave us gasping desperately for more. It is a phenomenal work full of surprises which end up making perfect sense. For a start - just like THE MOTHERLESS OVEN - it explores the generational gap opened up even further by the conceit that all mums and dads are constructs of their children. As mechanical objects, most are dismissively pigeon-holed in their parental role rather than regarded as individuals, then consigned to the scrap head once that role is over. "Parents are made to make children feel guilt. They exist to deny your freedom so they can make you believe it is theirs to give." That's Vera's take, and she has indeed been denied her freedom by being shut away in Grave Acre's equivalent of Number 10, to be home-schooled initially by the household Ink Gods. These are vocal bottles of indelible ink, and I promise that they're making sense right from the very first panel they appear in, however random their proclamations might sound. It's that sort of book. "They say that parents exist to give children something to rebel against, something that prevents them rebelling against anything that really matters... But what happens when a parent rebels...?" And it is most definitely a great big book of rebellion. Vera Pike is welcome whirlwind of vital rebellion - a natural impulse in the young - but she's not alone. Not everyone is content to be constrained by their roles. Most parents choose to have children. As we have seen, that's not the case in The Bear Park and, without giving too much a way, there is a satisfyingly circular structure to so much history here. 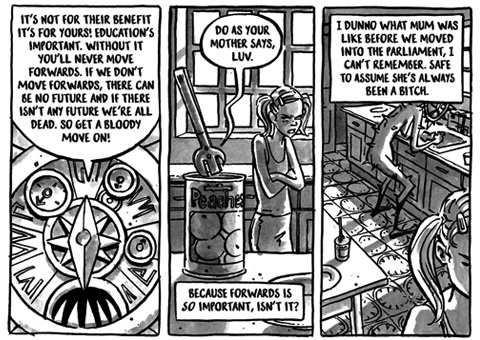 Time to pull back: THE MOTHERLESS OVEN was set in The Bear Park, a working class area with very specific and absolute boundaries. There was nowhere else. There were plenty of parents, but no brothers or sisters that I can recall. Instead of birthdays, everyone had a deathday. Scarper Lee's was imminent. THE CAN OPENER'S DAUGHTER begins in the much more affluent Grave Acre where everyone has a double-barrelled name and we see no such parents. Indeed the reigning (and raining) Weather Clock is terrified of being referred to in public as "Mum". It may not surprise you to learn that it's partly a class thing, but I won't explain why. In The Bear Park's schools they teach Circular History and Mythmatics. 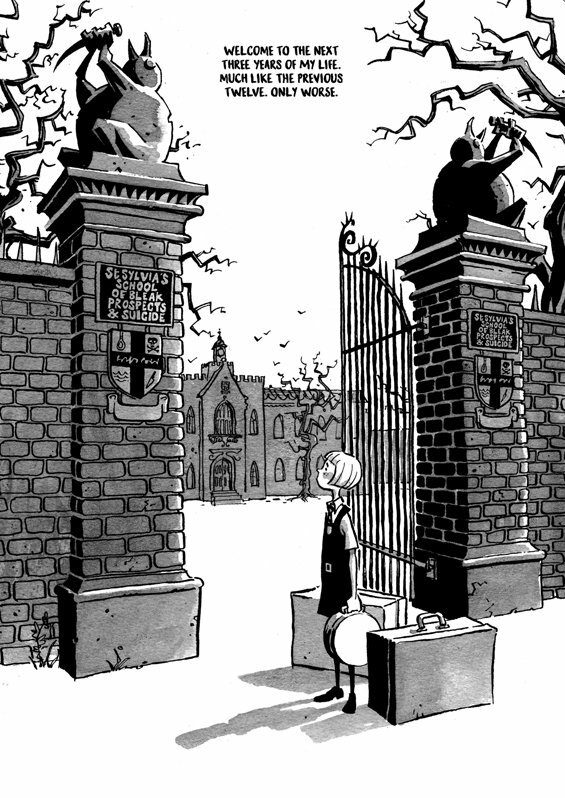 In St. Sylvia's School of Bleak Prospects and Suicide, the boarding school to which Vera is banished after a big breach of etiquette they teach Probable History and Terminal Vertices. "Everyone paid attention in Terminal Vertices, not because Miss Cavendish-Hole was any less dull, but because your life depended on it." In Grave Acre you aren't assigned a deathday; you plot your own suicide graph using desolation logarithms found in Cullculus. You choose your fate. Vera Pike chooses not to have one. She hides her graph, unplotted, under the mattress. 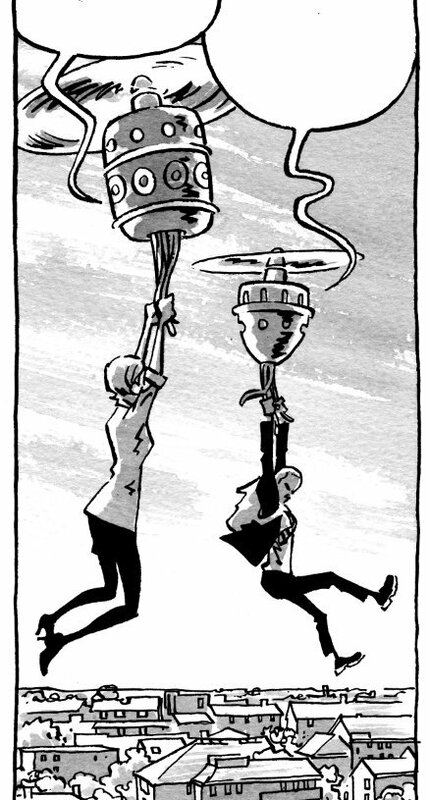 It may be by now that those who've already read THE MOTHERLESS OVEN are starting to see the connections. They're ever so clever once revealed, and I'll just jog them along a little here when Vera speaks up during a class in Hauntology where they're studying The Bear Park and deathdays. "Sir, how do we get to Bear Park?" She's met with roars of laughter. "C'mon, Pike. It's as impossible to travel from Grave Acre to The Bear Park as it is to travel from today to yesterday." But Vera's Mum originally came from Bear Park before she got ideas above her station, as did Vera and her Dad. So what's up with that? 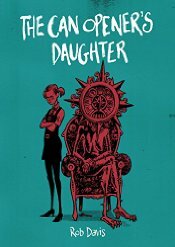 The art is deliciously British with nods at St. Sylvia's to older boarding school comics and if I detected a Gorillaz / Jamie Hewlett vibe in THE MOTHERLESS OVEN, in THE CAN OPENER'S DAUGHTER I'm minded of the likes of Steve Parkhouse in THE BOJEFFRIES SAGA and, while watching the Weather Clock herself - with her spikes, claws, long, curved neck and grotesque in-your-face face - I couldn't help thinking of Gerald Scarf's work for Pink Floyd's 'The Wall'. It's partly on those grounds that I couldn't shake the notion that the Weather Clock and the Can Opener were riffs on a strident Margaret and a cowering Dennis Thatcher, even if it's the Weather Clock constantly sozzled after using her husband to uncork the bottles. Talk about enabling. Speaking of ascensions, I loved Vera's growth in the book from a baby-faced brat with bunches, through uniformed pudding-bowl private-school girl, to chic, commanding rabble-rouser by simply untucking her shirt and ditching the pinafore dress. The animation of the Ink Gods - the glass, stoppered jars sat on small pedestals - is exquisite and all the more remarkable for being accomplished purely by the lettering. They don't move, but they are emphatically alive. If THE CAN OPENER'S DAUGHTER dovetails as wickedly as I've asserted with THE MOTHERLESS OVEN, you may be wondering how. I've barely mentioned the latter's narrator, Scarper Lee, and Castro Smith not once. Castro, you may recall, has Medicated Inference Syndrome kept in check with a surgically implanted Brain Aid which stops all the signals becoming noise. It is Castro who can see all the connections. He figured out who Vera's Mum was long before everyone else. He's writing a Book of Forks. "Forks are choices, forks are everywhere. My book is a theory of everything." As THE MOTHERLESS OVEN concluded we left Vera and Castro alone together on the other side of The Bear Park's fence, while Scarper's deathday was still looming large. So how do we get there from here? I'm not telling you. "My interest is piqued - you are a source of intrigue, Mr. Smith. What is a Book of Forks and what can it offer me?" "It's an encyclopedia of all possible histories and a post-mortem of all possible futures. It explains deathdays, how weather works, where Gods came from, why the Immortals died out and how to repair a kettle." He can be quite practical, can Castro. "The forks... three paths into one... one path into three..."
Next: Rob Davis concludes his own Book of Forks.